Hello! We would like to take the time to let you know a little bit about our company. In 1909, Jim Rott's grandfather began doing home improvements in Buffalo, New York. 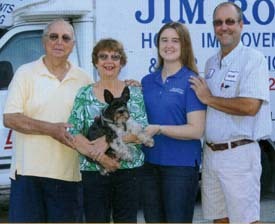 In 1972, Jim moved his family to Vero Beach. Jim Rott has been a specialist in Home Improvements in this area for over 38 years. Jim's son, Kevin, joined the business in 1984 and is a State Certified Building & Air Conditioning Contractor. This company is the elite of the field, and that is not bragging, it is fact! Pick almost any area from the beach to the mainland and we can furnish a list of satisfied customers that have had work performed that would be similar to what you might need done now, or in the near future. Since 1972, Jim Rott Home Improvements & Air Conditioning has been providing Vero Beach residents with quality service and workmanship by skilled and trustworthy technicians. We are licensed air conditioning sales and service contractors, certified Indoor Air Quality Specialists (duct cleaning & sanitizing), as well as painting, aluminum and vinyl specialists (including siding, soffitt, fascia and gutters), and licensed building contractors allowing us to satisfy you with a full range of home improvements. We do various jobs big and small, from as simple as hanging pictures to installing new air conditioning units, painting large buildings, or enclosing patios. Jim Rott Home Improvements & Air Conditioning, Inc. invites you to take a look around your house. You may need some repairs you’ve never even noticed. If you can "Dream it, We Can Create it! Stay cool during the summer months don't wait until it's too late. Get your Air Conditioner serviced now!